Given all of the bragging about what the Genesis framework is, and how it supposedly makes a web designer’s life easier, it’s odd how any and all code samples have been left out. Notice that you are never shown any code. Even in the forum, the code is rarely shown. It’s just another example of how StudioPress is dishonest with its buyers and potential buyers; it’s dishonesty by omission. As was mentioned on the previous editorial, the best part of WordPress — the reason it got so popular — was that it separated design from function from content. Yet StudioPress found a way to re-merge function and design, and made it difficult/impossible in the process. Below you’ll find several samples of the current StudioPress themes, compared to the Revolution/StudioPress themes of yesteryear, as well as other current themes from other authors. So before you make the mistake of buying it, ask yourself this: Is this really want I want to edit? Because honestly, it’s almost easier to just write a theme from scratch! Note: If you’re planning to skim the editorial, and are only looking for suggestions on which themes to use, then here it is: ThemeForest, Elegant Themes, Gabfire Themes, FlexiThemes, AppThemes and Graph Paper Press. Each of those has numerous easy-to-customize themes. 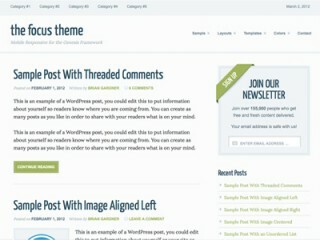 ThemeForest alone has hundreds of excellent themes from several respected authors; it succeeds where StudioPress fails. If you wanted to change the homepage, for example, that was easy to do — simply change CSS as desired (styles.css), and then make changes to home.php in WordPress. Add, remove or manipulate PHP and/or HTML as needed. That’s how most themes were, and are to this day. Notice that it’s nothing unusual — some WordPress PHP syntax, some DIVs for styling, and a little bit of HTML. I could easily change some or all of that in a matter or hours, making a custom site. Again, all that’s required to change the homepage is editing home.php. It’s a nice wireframe to build your own custom site. 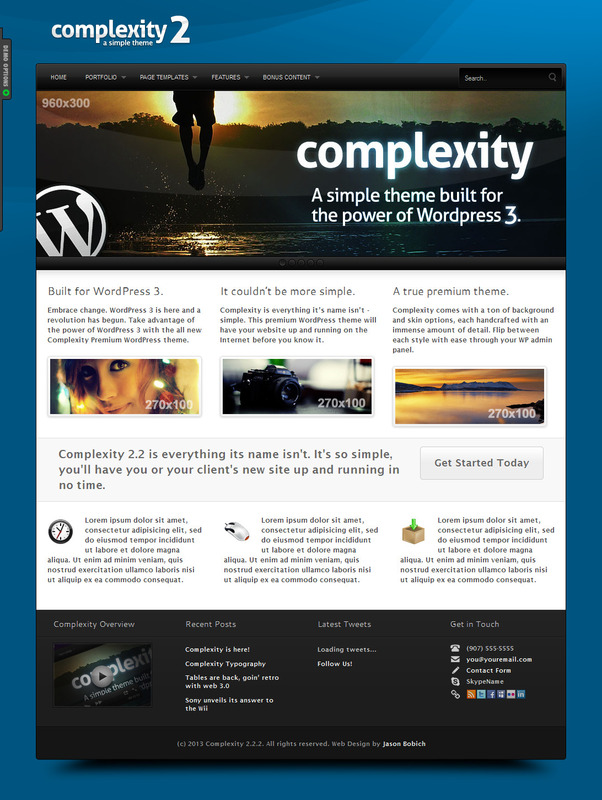 The Complexity Theme is one of the nicest and most feature-rich themes on Theme Forest. It can make portfolios; present video, audio, and photo content; and has a wide array of presentation options — lightboxes, slideshows, font options and more. Kudos to that author for doing such a nice job on it! Notice all of the markup that’s been commented out for users. Things like that are extremely helpful when editing a theme! And although our site removes space/indentation, the code has plenty of it. For example, all of the if/then/else statements are spread across multiple lines, to make it easier to understand. The StudioPress Genesis framework and child themes are, by contrast, a mess. For one, all of the code is spread across a minimum of two theme folders. The framework contains some of the code. The child theme may or may not override that code. When the framework is missing the code, the child theme has the new added code. And sometimes — CSS, for example — neither one appears to have the code. * in the form of a child theme. * * Index template, initialises Genesis. And hope it’s the right one if multiples are present. Everything is wrapped in Genesis code, in little snippets here and there. The full page is never in a single location, where it can be easily edited. Many times, the code that controls a single page is in multiple files. Focus isn’t even a fancy, feature-rich theme. It’s just a blog! Of all the WordPress themes out there, free or premium, I’ve never seen something as screwy as Genesis. It’s really not a WordPress theme, but a PHP template and application system built on top of WordPress. It’s proprietary, it’s hard to edit, and it’s overall a nuisance. ThemeForest alone has a huge selection of themes that are easy to edit, look great, have more features, and are about half of StudioPress $80 price tag ($45 each). It’s an inferior product that costs more. In addition to getting a good theme for your WordPress site, make sure you’re using good hosting! Don’t get an “unlimited” host owned by EIG, or a brand like Godaddy or 1&1 Internet. Don’t use HostGator, BlueHost, JustHost, Fatcow, etc — they’re all owned by EIG, and they all have slow page load times that hurts your SEO and frustrate your users. There are better hosts! If you want unlimited, stick to a reputable company like Site5 or JaguarPC. Or use a host like StableHost, where your resource allocations (space/bandwidth) are guaranteed. Have comments or feedback? — Be sure to share your thoughts at this forum post. Deinterlacing noise at the bottom of Top fields? MiniDV capture/transfer with Pinnacle USB box? Digitizing Hi8 tapes needs a TBC? VHS capture not interlaced as expected? VHS archiving project, nothing but problems? Which Huffyuv version, how to install Windows 10 x64?